You can now play ‘Cut the Rope‘ game online for free in your HTML5 compatible browsers. Cut the rope is one of the most popular game initially developed for Apple’s iPhone and Google Android mobile phones. But you can play many Cut the Rope levels for free online. It works in Chrome, Safari, Internet Explorer 9 and Opera.I play the game with Google Chrome, i have no problem with it.Although site suggests the Internet Explorer 9+. If you are older than 13, you can play the game right now by clicking the link below. Cut the Rope is the one of the best Puzzle and brain game. 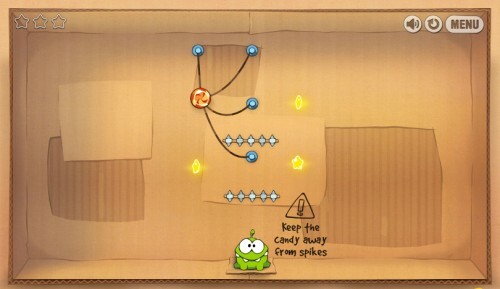 Kids can improve their puzzle solving techniques by playing Cut the Rope like games. If you have spare time, You can play this game in your browser.